Hello November! The knitting from my last post has grown up into a full-fledged pattern now available on Ravelry: Ingersoll. 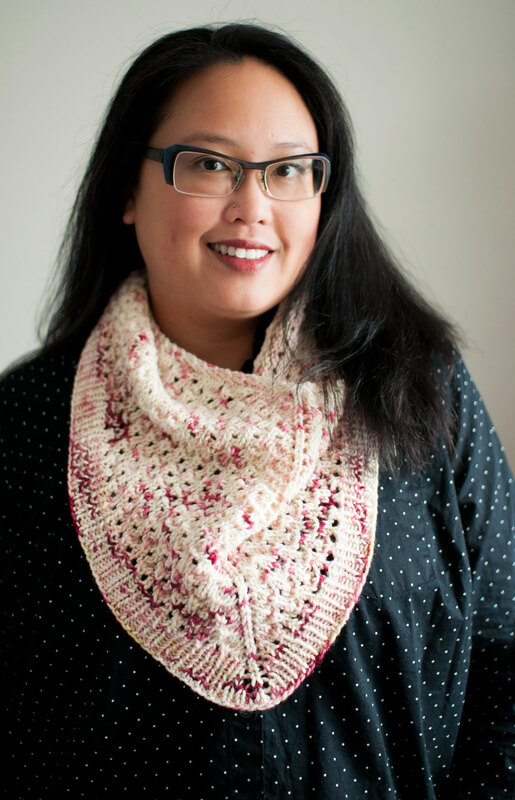 Ingersoll is a top down elongated triangular shawl or bandana cowl in an intuitive stockinette lace pattern. 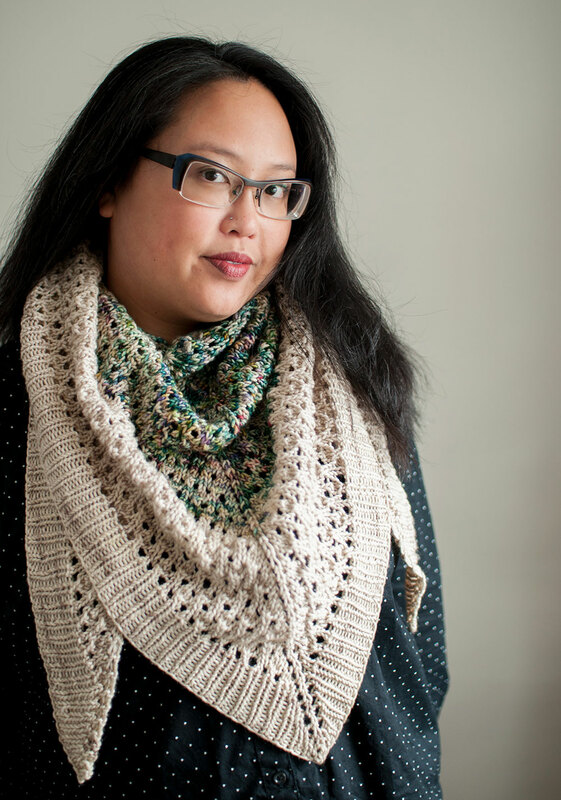 The cowl is perfect for that special skein you’ve been saving, or pair it with a contrast colour for a snuggly shawl. 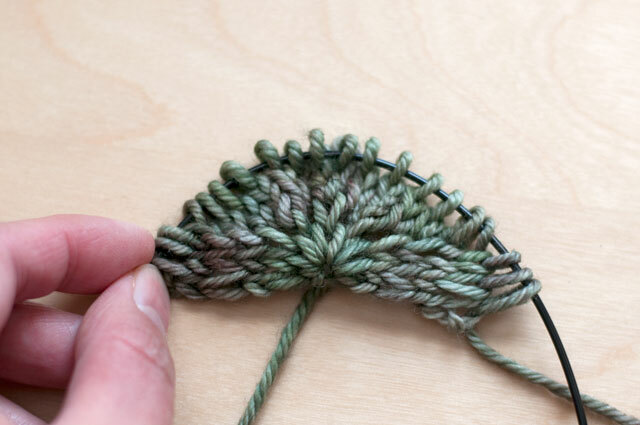 Both begin with a disappearing loop cast on (tutorial included), and a simple ribbed edging provides a clean finish. Instructions are both charted and written out row-by-row. The beautiful yarn is from my friend Lichen and Lace. It’s a nice round superwash merino and just takes 1 skein for the cowl (3 for the shawl). The cowl is shown in Orchid, and the shawl in Pressed Flowers (a particularly green skein that I just had to pick up at the Purple Purl) and Linen. The shawl and cowl begin the same, with a tidy circular cast on and increases at both ends and the centre. 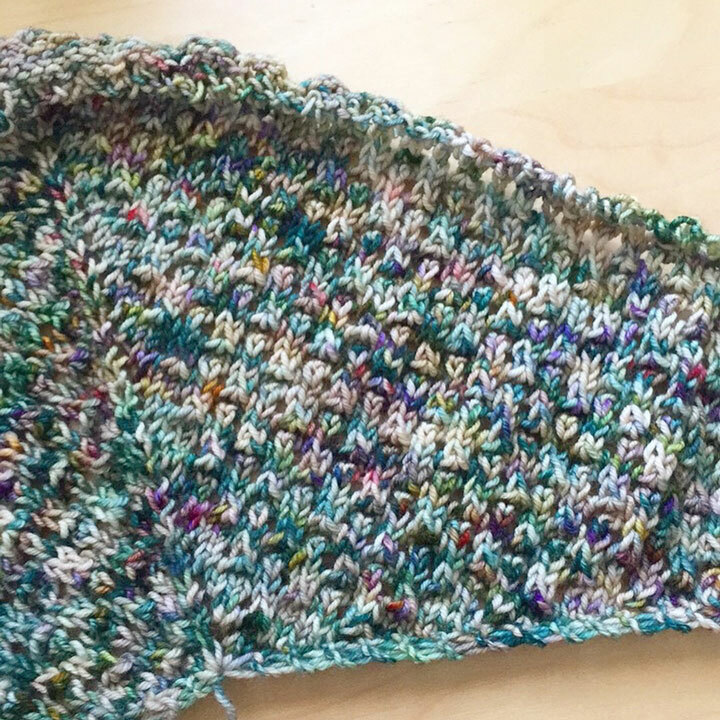 You can decide after the first couple of repeats whether you want to join it to become a cowl, or continue working flat for a nice big shawl. The lace is very easy – three of every four rows is stockinette! Although the skein of Pressed Flowers is only 1/3 of the yarn for the shawl it comprises about half the depth. It’s a great way to get that special colourway up next to your face! It’s been so warm, it doesn’t feel like autumn at all! But the leaves are still slowly changing, the gardening is almost done, and I’m looking forward to pulling a few sweaters out. The tomato plants got very, very tall – way over my head! But we put them in late, the weather was crappy, and I think our yard just isn’t sunny enough for them. 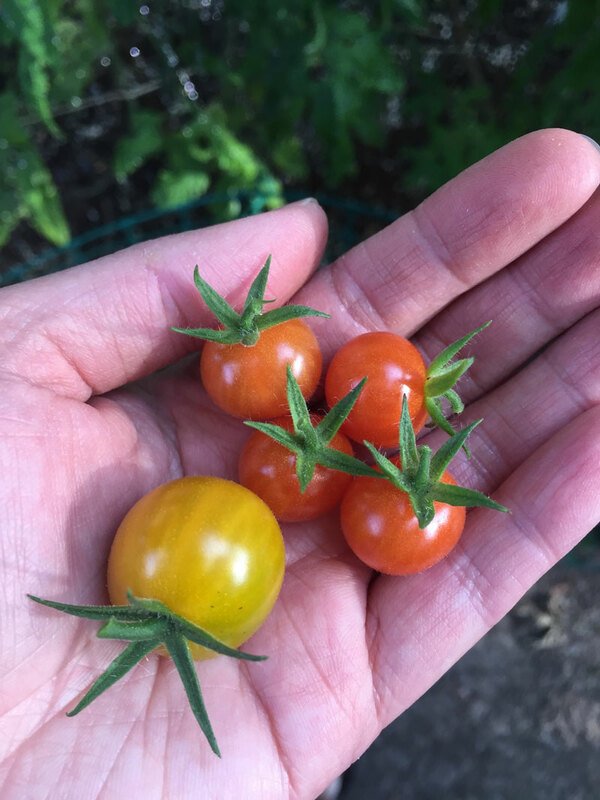 We’ve gotten a few cherry tomatoes, enough for snacking and a couple of salads, but not nearly what I was hoping. There are still quite a few green ones on the plants, but at this point it might be a batch of green tomato relish. We had a fair harvest of green/purple/yellow beans, and a couple of cucumbers. Everything else either didn’t grow or was eaten by bugs. They ate the marigolds down to nothing! What the heck. No basil, leafy veg, or eggplant survived. I’m not sure what we’ll do for next summer – maybe relocate the tomatoes to a different part of the yard and try a smaller, deeper bed. Maybe growing in containers in the yard? I’d be afraid that the raccoons will just come and dig them up or knock them over, like they did with our patio containers this year. 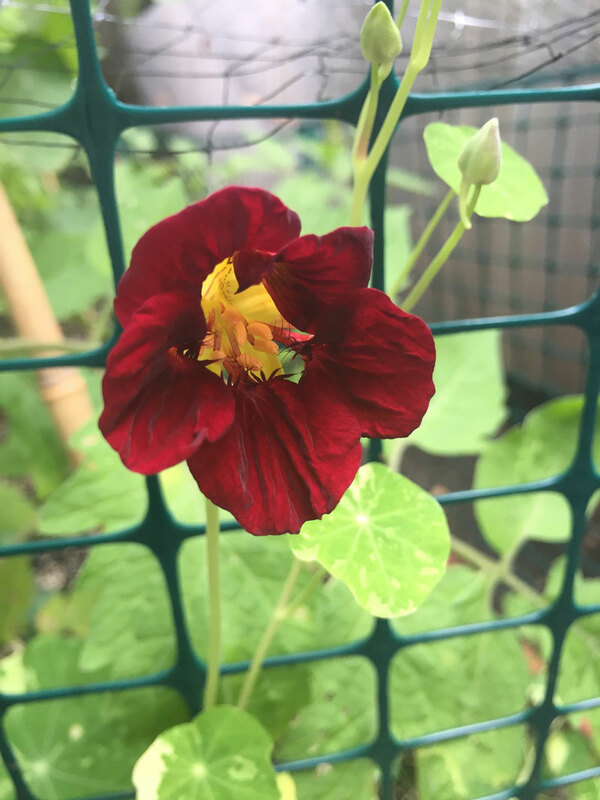 The nasturtiums didn’t do anything until about the end of August, but at least we got a couple of pretty flowers. 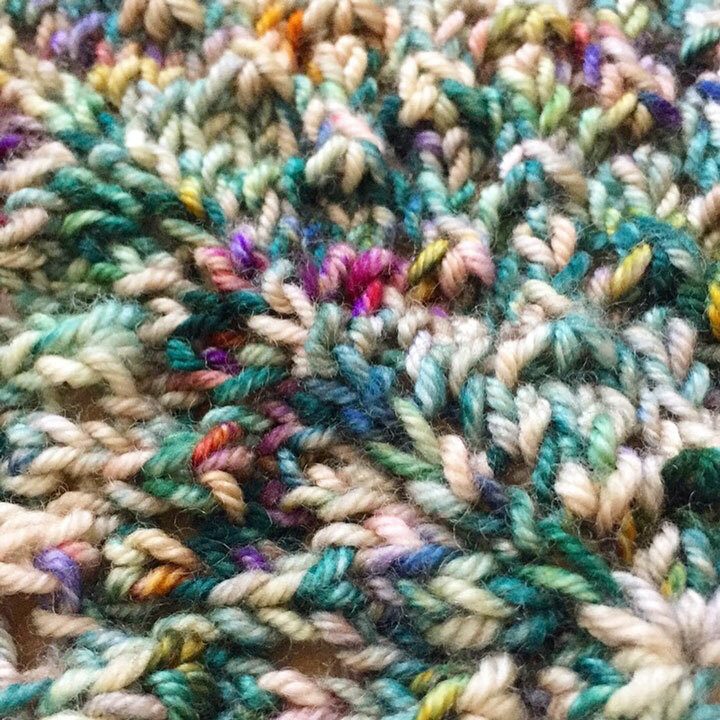 I’ve been having elbow issues so I’m trying to limit my knitting to work, but I still need something to make as a hobby! I definitely want to sew a few things for winter but I don’t have a lot of room to work in at the moment. With the weather (kinda, sorta) turning, I wanted to replenish my candle supply for the winter. I’ve never made them before but why not try? 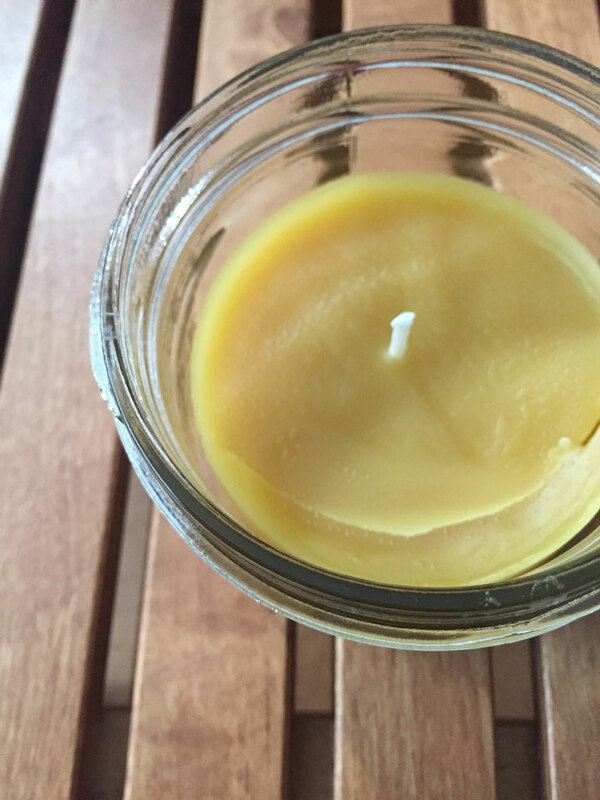 I ordered beeswax and wicks and poured just a few jars to try it out. Glad I did, because these wicks were clearly not thick enough for this size of container! 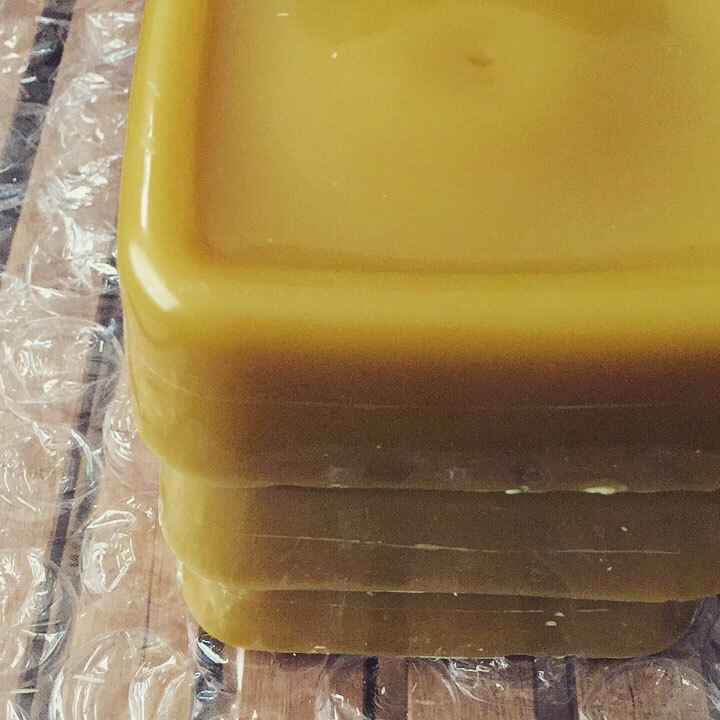 When I burned it, the wax pool was only about 1″ across and it melted straight down. I also knew they were going to crack because I didn’t let them cool slowly enough. But I learned a lot and promptly ordered more wicks to test. I’m not much for scented candles, but I might add a bit of essential oil to the mix next time, probably lavender and peppermint. 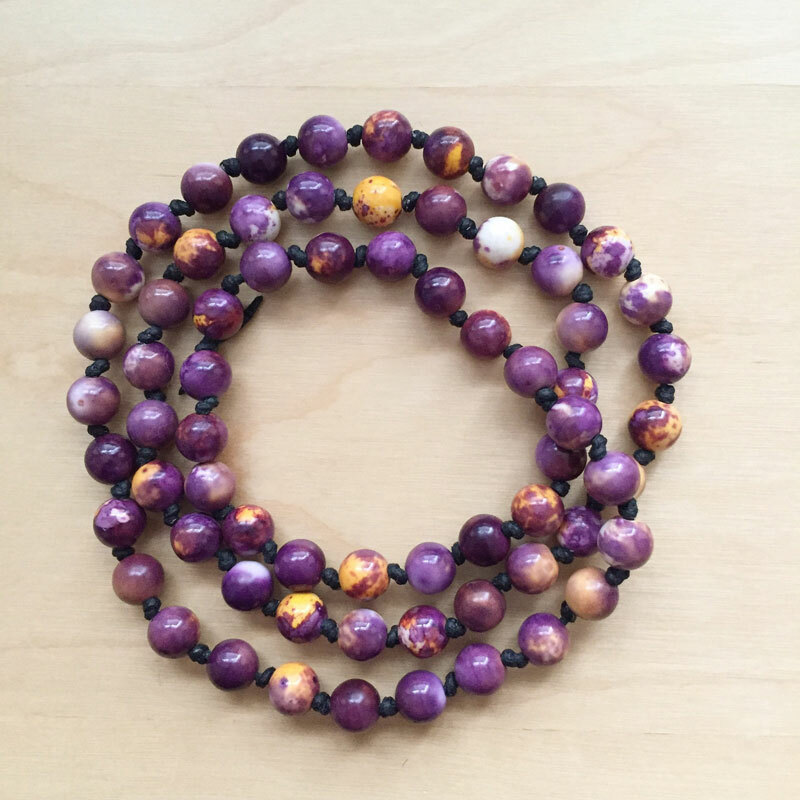 I went looking on Etsy for some not too expensive, natural stone and non-metal necklaces without clasps (my skin gets angry quickly) to jazz up my rather boring t-shirt-dress wardrobe, but couldn’t really find what I was envisioning in my head. So – you guessed it – I had to make it myself! I wanted to use silk thread but the ones I ordered were too small for the bead hole size (oops). Waxed cotton worked great though! It also comes in lots of colours and is pretty inexpensive. This one is black onyx and it is heavy, but I like that! 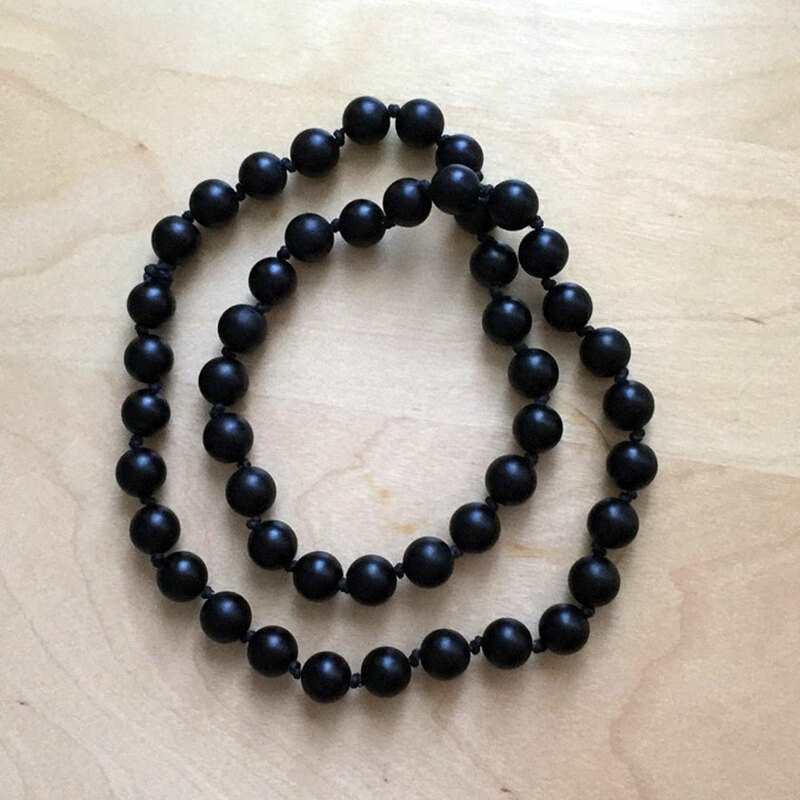 I wanted to make sure I wouldn’t one day get caught in a necklace-falling-apart-and-beads-going-everywhere situation (why yes, this has happened to me), so I decided to knot between the beads. It’s harder than it appears, but I think I’ve gotten the hang of it. The waxed cotton is WAY easier than silk for these knots. 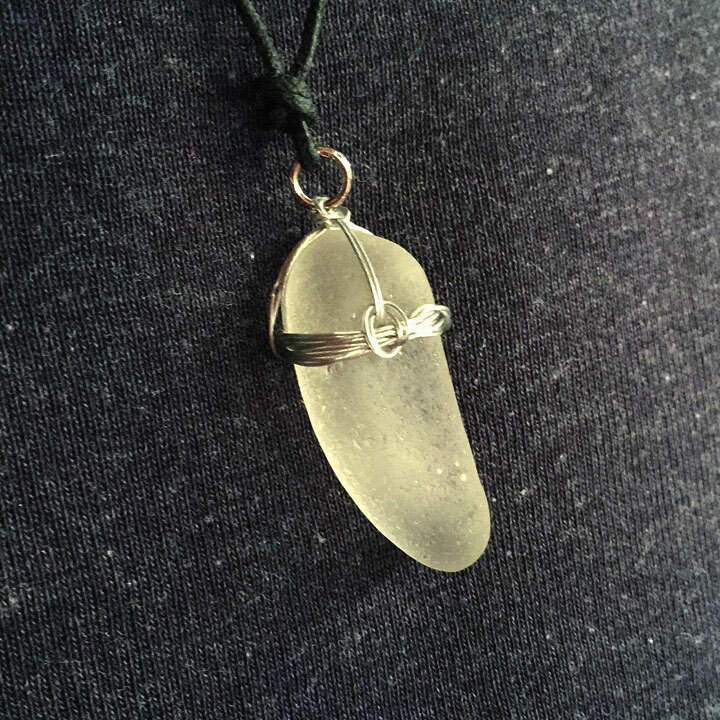 Dale got a necklace well – we made it from a piece of beach glass we picked up on our lake excursions. Knitting? Well yes, I couldn’t completely stay away from it! After sending off a work sample sweater last week I cast on with a skein of Lichen and Lace worsted in ‘pressed flowers’ – this skein is especially green and vibrant! I worked up a really quick triangular shawlette, it was loads of fun. So now I’m knitting another, but with a different final shape in mind. I’ll definitely write up this pattern as soon as I can, so keep an eye out! 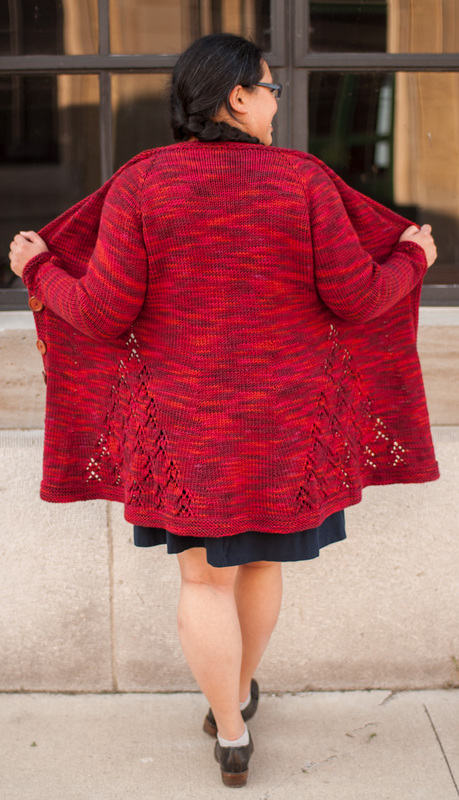 One last thing, my pattern Habanero came out in the 15th anniversary deep fall issue of Knitty a couple weeks ago! 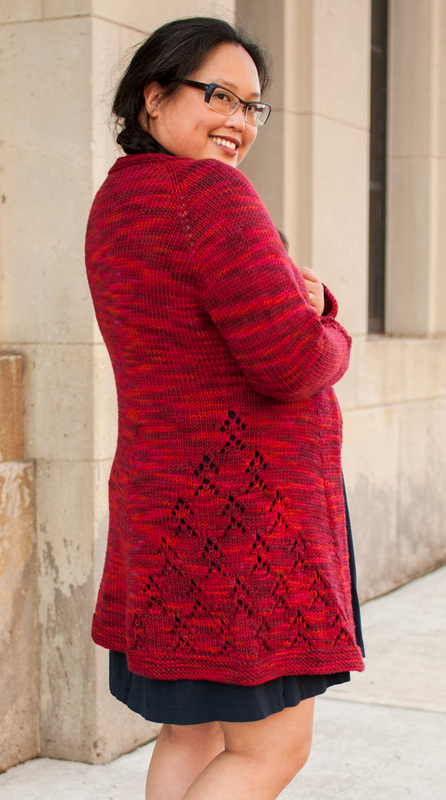 This long cardigan is worked seamlessly from the top down in chunky Lorna’s Laces yarn, with triangular lace insets on the sides paired with a flared shape. I’m going to be living in this one this winter! 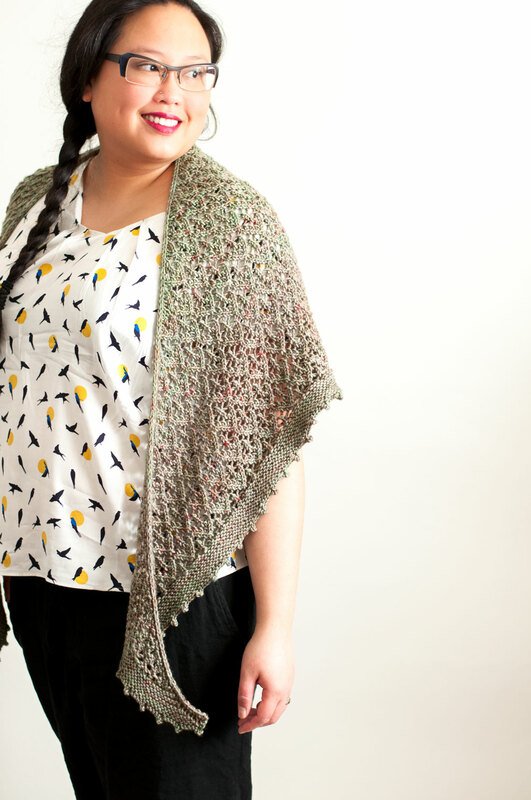 It’s been ages since I self-published a pattern, so I’m especially pleased to present the Sackville Shawl! 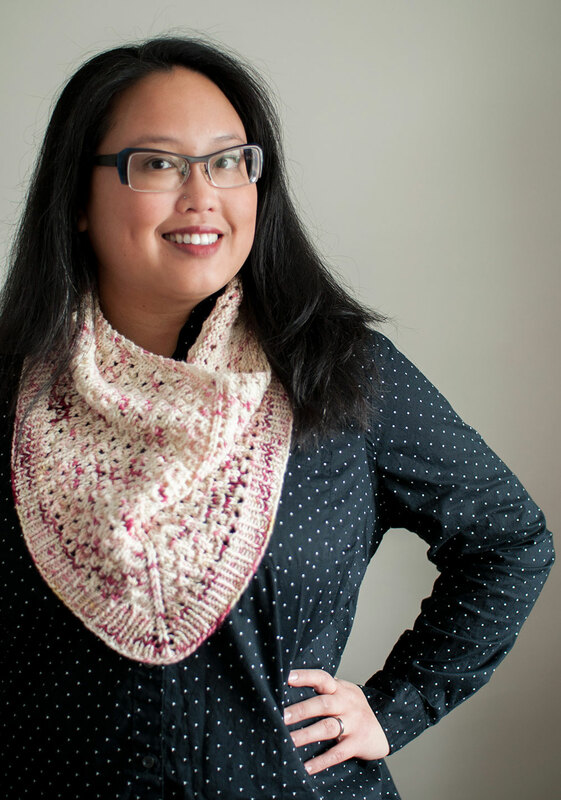 This generously sized (80″ wingspan) worsted weight shawl works up fast from the neck down, with an all-over lace pattern and garter stitch border. 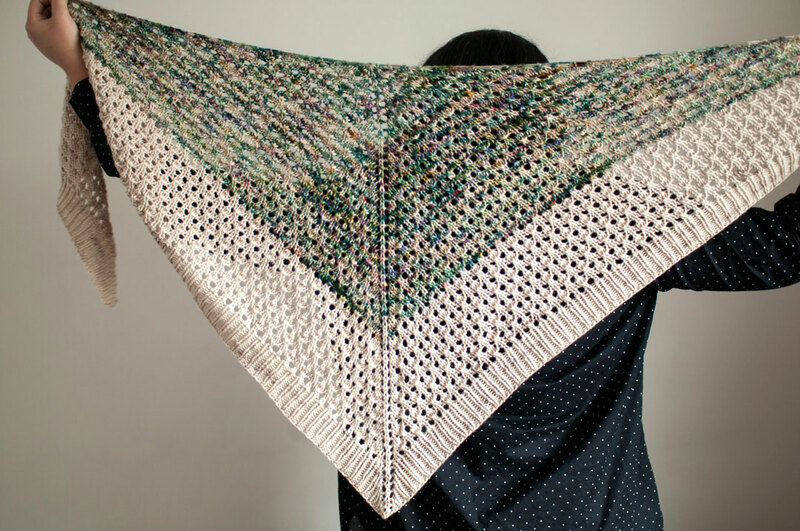 Buy, fave and queue Sackville Shawl on Ravelry! 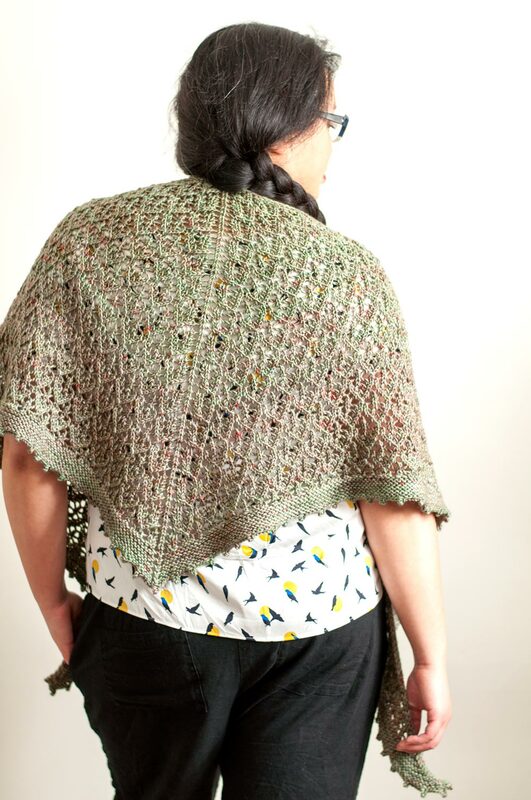 Sackville features yarn from my friend Megan, who used to run Lettuce Knit! She’s moved out to the east coast and has been dyeing up a storm. Sackville uses her worsted weight yarn, in the awesome colourway “sea glass”. I didn’t pay much attention to the order of my 3 skeins, but it worked out so that there’s more pink bits towards the bottom of the shawl for a subtle gradient. 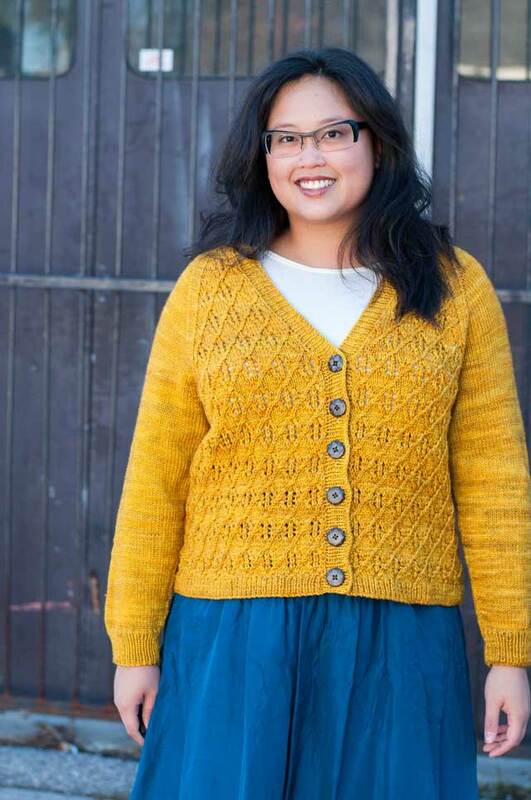 Sackville is knit from the top down, beginning with an interesting Disappearing Loop cast-on instead of a garter tab. It’s similar to an adjustable loop in crochet, and I’ve also seen a similar one called the “pinhole cast on” (which has an extra step or two). 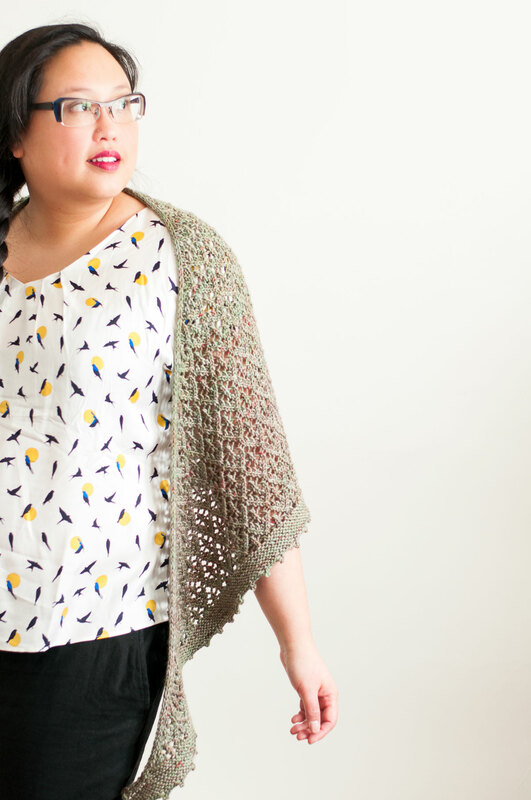 In the Sackville pattern I’ve included a photo tutorial to help get you started. 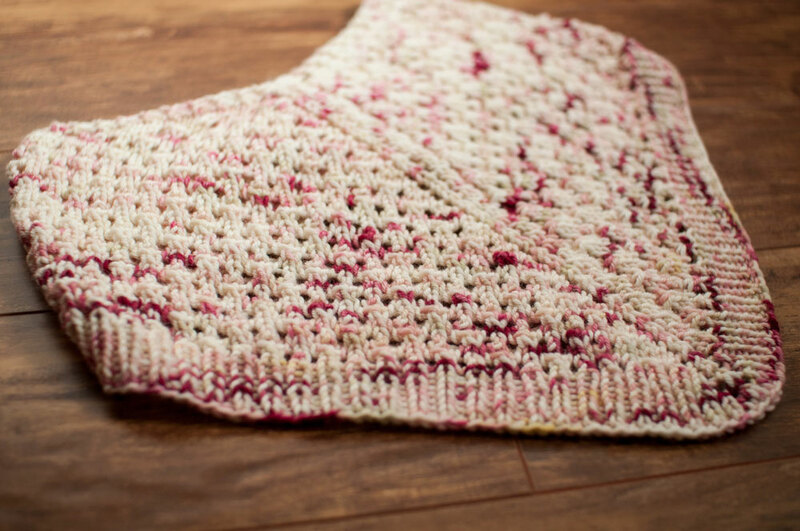 Sackville Shawl is presented as both charted and row-by-row written directions. The lace pattern stitches don’t quite stack on top of each other; instead, they’re a little offset at the beginning of each repeat, so the lattice is a little wonky! I quite like that. Increases at the edges on both sides result in a nice wide shawl that’s easy to wrap around, and the stockinette rolled edge along the top makes for a tidy finish that’s still easy to stretch out for blocking. 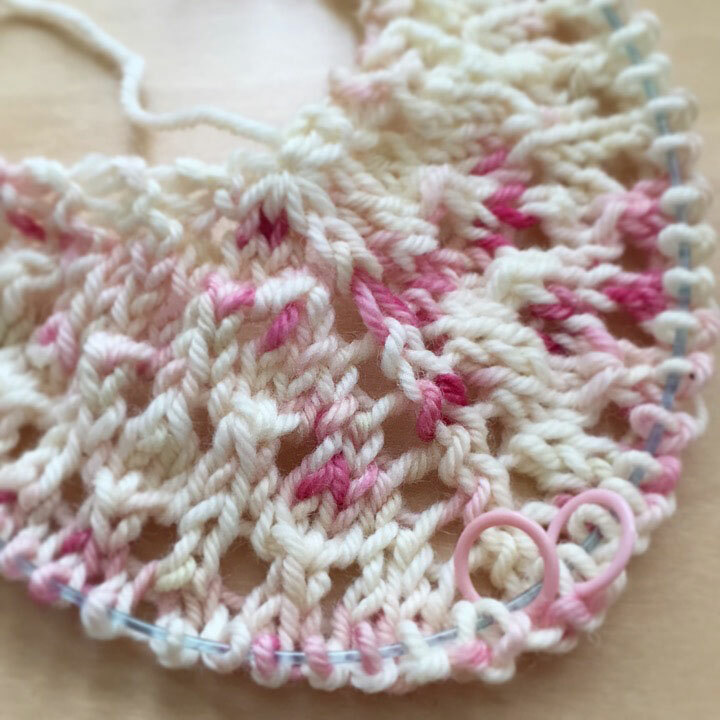 Once you’ve completed the lace patterns a few times, the border is very easy – just a few rows of garter stitch then a pretty picot bind-off. It should be simple to resize this shawl for different weights of yarn and different amounts – you can pretty much finish after any lace repeat (although you may have to rejig the picot spacing on the bind off if you have a different number of total stitches). 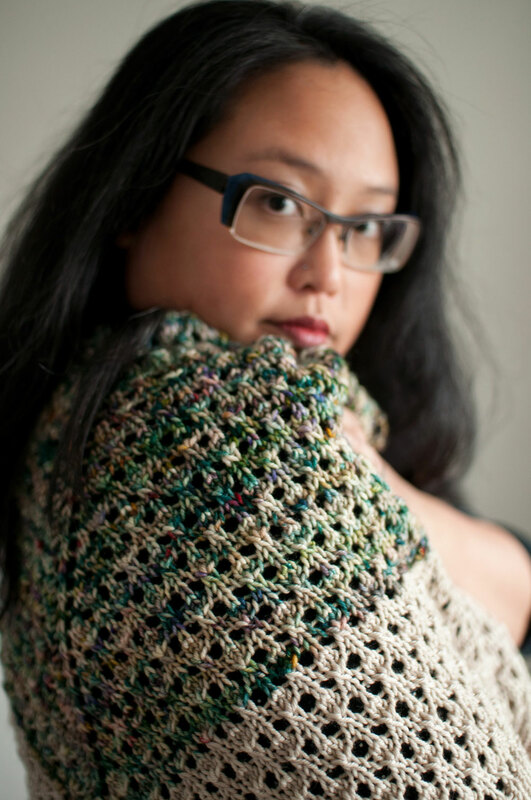 Buy, fave and queue Sackville Shawl on Ravelry!